When determining the most effective charity, we have to look at two things: the worthiness of the cause, and the efficacy of the charity's method. By cause I mean the area that needs our help, for example reducing malaria in Sub-Saharan Africa, and by charity I mean the particular organisation that is working to help the cause, for example Against Malaria Foundation. Any good assessment of charities must include both of these aspects. To understand the importance of these, first imagine a hypothetical charity that aims to increase the amount of doughnuts eaten by British police officers by distributing doughnuts to police stations each week. Even though this charity's method is a good way to reach their aim, it will always be a poor choice of charity to support because the cause, doughnut shortage in the UK police, is not a worthwhile cause to support. In this case, the cause is bad, the charity's method is good. Next, consider a hypothetical charity working to combat malaria in Africa by shouting at mosquitoes, commanding them not to bite people. In this case, the cause, reducing malaria in Africa, as we will see, is a very worthy cause, but shouting at mosquitoes will obviously not reduce the likelihood of them biting and infecting people with malaria. In this case, the cause is good, the charity's method is bad. The most effective charities use extremely effective methods to help the most worthy causes. What makes a cause worth supporting? 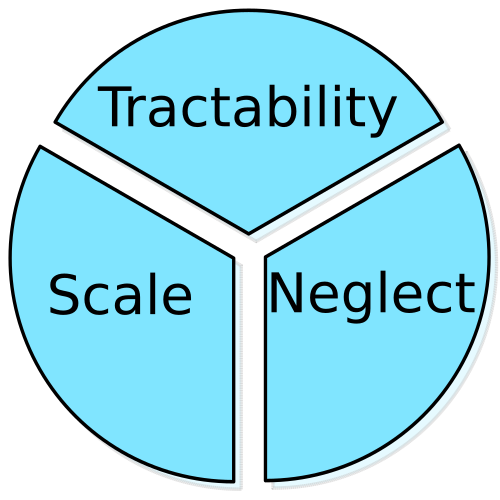 There are three concepts to consider about the worthiness of a cause: scale, tractability, and neglectedness. The first thing to consider is the scale of the problem. How many people (or animals) are afflicted by this issue? For those that it affects, how debilitating is it for them? What is the total suffering caused by it? Is this suffering likely to increase in the future, through more people being afflicted or the afflictions worsening? The bigger the scale of the problem, the more worthwhile the cause. Next, we must consider the tractability of the problem. That is, how easily and cheaply can we make a difference? A cause might be huge and inflict significant suffering, but if we cannot do anything about it, or it costs a huge amount to, then it is not a good cause to focus our donations on. There are, as we will see, some very large issues in the world for which we can have a significant impact for a very small cost. The more tractable a problem is, the more worthwhile the cause. Finally, we must consider what is already being done in that area. If there is already a large amount of money being donated to a particular cause, then more donations will have less impact. This is the law of diminishing returns. The more neglected a problem is, the more worthwhile the cause. For a charity to be effective, they must have a method of influencing a cause that can be shown, through evidence, to work well. Too many times we see charities that use a method that sounds ingenious but that actually has little impact or even a negative impact on the problem it is trying to solve. Charities and third party assessors can use control studies to estimate the effectiveness of their intervention. Preferably these studies are done before an intervention is put into large-scale use, and the charity must be open to adjusting and refining its methods as more evidence and self-evaluation is made. Before charities are recommended as being amongst the most effective, they must be transparent with their impact, preferably in a quantifiable way (although there are ways to assess charities when a qualitative approach is not possible). Generally, the most effective charities focus on one evidence-based method which has significant impact on one cause. The more different methods used and causes focussed on, the higher the chance of one or more of them being bad methods or unworthwhile causes. Common metrics for charity effectiveness are overhead costs and proportion of donations that go to employee's and CEO pay. These are merely superficial metrics that have been the focus popular newspaper headlines of the past few years, but in reality they are not anywhere near as important as the worthiness of the cause (its scale, tractability, and neglectedness) and the efficacy of the charity's method. A charity could put all their donations to the cause and have only volunteer employees, but if they cause is not worthwhile, or if the methods used by the charity do not work, then the charity is clearly not very effective, but would score highly when considering overhead costs and employee pay metrics. I, like most people, used to think the difference between the effectiveness of different charities was relatively small, so that it would be a waste of money to try to assess which ones are the most effective. This is a misconception that has been shown to be wrong. So wrong in fact that the difference between the most effective charities and even a typical charity is around a factor of 1000. That is, donating £1000 to a typical charity is equivalent to donating £1 to the most effective ones. Furthermore, some charities even have a negative impact on the cause they are trying to help because they are relying solely on intuition and not evidence. This means that, as I have said before, it is so important to consider the effectiveness of the charity you are supporting, because your donation could be having the opposite effect to what you want. In the next blog post, I will discuss some of the most effective, and least effective charities. These ideas are put into practice by several organisations such as GiveWell and Animal Charity Evaluators. Both of these are fully transparent with their assessment criteria so you can see which charities they recommend to be particularly effective and why, as well as understanding the potential flaws of these assessment methods. If you would like to learn more about effective altruism in general then I would recommend you check out Will Macaskill's book: Doing Good Better. All profits from the sale of this book are donated to the most effective charities. If you would like a copy but cannot afford it, please let me know and I might be able to sort something out. * Having said that, I understand that not all charities aim to save lives; many aim to relieve suffering and improve wellbeing by prevention or treatment of non-fatal illnesses, or to improve education, or to fight discrimination, to name a few. It is clear that charities that support these causes, rather than causes that more directly result in death, could also be effective and must be assessed in a quantifiable and comparable way. Since it is unclear whether saving one life or treating 1,000 people for dibilitating but non-fatal illnesses, this comparison is of great importance. More information about these ideas can be found here. This will be the subject of a future blog post. Teng, T. O., Adams, M. E., Pliskin, J. S., Safran, D. G., Siegel, J. E., Weinstein, M. C., Graham, J. D., 1995: Five-Hundred Life-Saving Interventions and Their Cost-Effectiveness , Risk Analysis, 15: 369–390.